Memorial Hermann Sugar Land Hospital is part of the Memorial Hermann Health System, the largest not-for-profit health system in Southeast Texas. Memorial Hermann Sugar Land is a 149-bed, full-service acute care community hospital located in Sugar Land, Texas, and serves Fort Bend County, a populous region of nearly 700,000 just southwest of Houston. The organization excels by “bringing together quality, safety, and a family-caring-for-family approach” that “sets the pace for the hospital of tomorrow.” Memorial Hermann Sugar Land also is the anchor for more than 20 associated care centers in the Sugar Land area that provide primary and specialty care services in cardiology, diagnostics, emergency care, imaging, occupational therapy, oncology, physical therapy, rehabilitation, sleep disorders, speech therapy, sports medicine, surgery, and urgent care. Staffed by 641 employees, Memorial Hermann Sugar Land operates with a revenue of $135 million. Memorial Hermann Sugar Land ranks among the top 10 percent nationally for a number of performance metrics, including emergency center arrival-to-discharge time, compliance with regulations to reduce medication errors, bed turnaround times, radiology and laboratory result turnaround times, and the use of computerized physician order entry. Retention results for fiscal year 2016 are at 90 percent for employee partners, 100 percent for physician partners, and 90 percent for volunteer partners, all comparable to or exceeding national benchmarks. Additionally, the first-year retention rate for all partners is nearly 75 percent, exceeding the national level. Patients said they were “likely to recommend” several service lines and departments—including day surgery, emergency care, gynecology, orthopedics, and women’s health—at levels that put Memorial Hermann Sugar Land in the Press Ganey Associates 90th percentile for this measure. Operating earnings (before interest, depreciation, and amortization) since 2014 have exceeded Standard and Poor’s (S&P) national median for AA-rated nonprofit hospitals. Operating margin has met or exceeded the S&P benchmarks for the same group since 2013. Since 2011, Memorial Hermann Sugar Land’s focus on patient safety has led to zero “never events” (medical errors that should never occur) related to pressure ulcers, ventilator-associated pneumonia, transfusion reactions, and deaths from normally low mortality conditions. Memorial Hermann Sugar Land ranks among the top 10 percent nationally for a number of performance metrics, including emergency center arrival-to-discharge times, compliance with regulations to reduce medication errors, bed turnaround times, radiology and laboratory result turnaround times, and the use of computerized physician order entry. 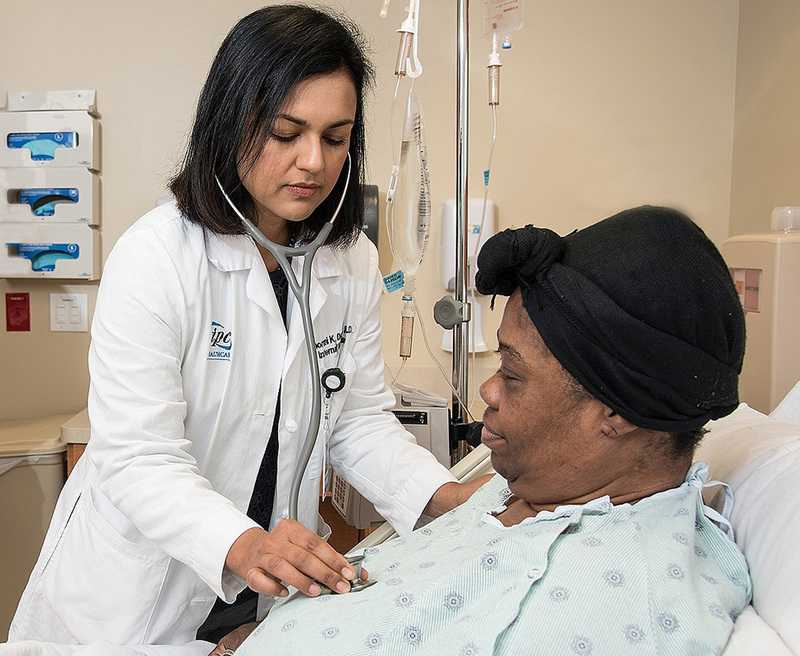 Readmission rates at Memorial Hermann Sugar Land for acute myocardial infarction, congestive heart failure, and pneumonia are lower than those recorded by hospitals nationwide for this measure, according to the Centers for Medicare and Medicaid Services. Compliance rates for hand-hygiene regulations—recognized as the most important method for reducing the spread of pathogens in a health care facility—have matched or exceeded the national benchmark set by the Centers for Disease Control and Prevention for top 10 percent performance. According to standards defined by the Hospital Consumer Assessment of Healthcare Providers and Systems, Memorial Hermann Sugar Land demonstrates top scores for physicians, inpatient care, and orthopedics, as well as highest-level ratings for pain management in general medicine and orthopedics. Sustained levels of excellence in courtesy are shown for inpatient care, day surgery, and the hospital’s emergency center. Memorial Hermann Sugar Land’s “Values-Driven Leadership System” fosters an organizational culture characterized by workforce engagement, open communication, and high performance. Within the system, employees are hired under a three-step process that identifies persons who fit most strongly with the hospital’s “family-caring-for-family” core competency. Potential “partners” are interviewed by a panel of peer-level employees trained to assess this cultural fit. Retention results for fiscal year (FY) 2016 are at 90 percent for employee partners, 100 percent for employed physician partners, and 90 percent for volunteer partners, all comparable to or exceeding national benchmarks. Additionally, the first-year retention rate for all partners is nearly 75 percent, exceeding the national level. The annual Memorial Hermann Sugar Land employee survey for FY 2016 shows that staff engagement measures rank in the top 10 percent when compared to national benchmarks. They also surpass similar measures reported by a previous Baldrige Award health care recipient. The Memorial Hermann Sugar Land executive team sets direction and vision in its planning by following the ADVANCE strategies set forth by the Memorial Hermann Health System: Align with physicians, Deliver quality care, Value employees, Achieve operational targets, Nurture growth and innovation, be Consumer centric, and Enhance population health infrastructure. Memorial Hermann Sugar Land’s three-step “Values-Driven Leadership System” integrates strategy, mission, vision, values, and core competencies into daily operations. Using this system, senior leaders share key information with the workforce through multiple methods, including regular rounding (popularly known as “management by walking around”), breakfasts with the CEO, and family forums. Since FY 2010, Memorial Hermann Sugar Land’s market share has continued to increase in a competitive environment. Results from value-based purchasing (a federal program that rewards acute-care hospitals with incentive payments for the quality of care they provide to Medicare beneficiaries) have yielded a positive financial return for Memorial Hermann Sugar Land from 2013 to 2016.